Enable your children to have lots of fun creating wonderful recipes whilst learning about numbers, colours, patterns and shapes. This versatile set helps children develop their ability in a wide range of areas, from exploring number, shapes and colours to understanding trade, money, social roles and building and following instructions. 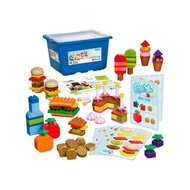 Use the menu card to order one of the items and then have the children make it, just like the picture. Get them to buy two items to learn how to add numbers together. All of the elements in this set are bright, colourful and with large pieces that have rounded edges, very friendly for small hands. Allows for varied role play with a café, shop and kitchen.